January, ahh, that post-holidays month. Definitely one of my favorite months to eat clean. In this first post of 2018, I share thoughts on January eating and a few of my favorite simple recipes to keep you cozy in the January chill. January is the perfect time to eat simple foods and let our digestive systems relax a bit after holiday abundance. I'm not one to go on intense/drastic diet shifts, so for me, focusing on eating plenty of vegetables, drinking plenty of warm fluids, and adding key superfood ingredients is the perfect way to simplify my foods and strengthen my immune system (not counting all the awesome supplements I love taking). Daily gentle cleansing and eating probiotic-rich gut-healhty foods are two very accessible ways to promote digestive wellness. This can be as simple as starting your morning with warm lemon water and adding some sauerkraut to your meals. (Both very doable.) In addition, laying off the dairy, grain, and sugar-heavy foods will maximize the results of the gentle cleansing and fermented food, and drastically minimize your chance of catching colds, leaving you with more energy to make best use of the new year. Small choices can have powerful results. Below are a few of my favorite recipes from my January cooking adventures. The last recipe is for my version of Jamu, a popular Indonesian health tonic. For my body, jamu is the best way to do gentle cleansing on a daily basis. Enjoy! Heat olive oil in medium sized stock pot, sauté onions 3-5 minutes. Add garlic, sauté for an additional minute. Add fennel and potato and and pinch of salt, sauté for 10-15 minutes on low heat, allowing vegetable to sweat and soften: the sea salt will help draw out the flavors of the fennel. Add squeeze of lemon. 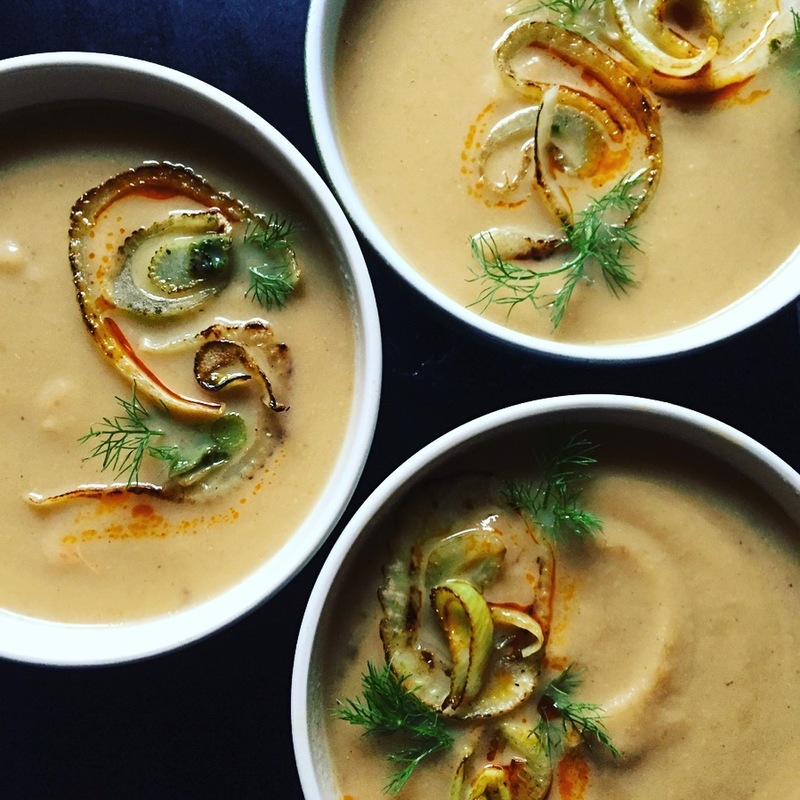 Before adding broth, take a minute to taste the fennel here, it should taste really good, the salt and squeeze of lemon should draw out and strengthen the natural fennel flavor. Add broth and simmer on low for another 10 minutes until veggies are soft and flavors begin to incorporate. Turn off heat and allow soup to cool for 5-10 minutes. Blend in batches in a high-speed blender or use an emersion blender. Process until smooth and then return to stock pot (if you used the blender). Taste and adjust flavor accordingly, use salt, black pepper, cayenne, and lemon juice to taste. * You may also like to add a bit of high quality olive oil here. *if the depth of flavor is not coming out into the soup, you may also try adding a bit of miso paste to add more tastiness to the soup. If you do wish to experiment with the miso I recommend using a light brown miso (lightly sweet and salty) rather than a white miso (sweeter) or a red miso (deeper, more salty). Not only is this Hasselback technique in cooking beautiful, it's also super tasty, because we love the crispy edge, right? So, instead of several of these, we have them all over the place! The hasselback technique is actually quite simple but needs to be done carefully and with a sharp knife. Preheat oven to 350F. To prepare the butternut squash, start by removing the stem and base of stem with a sharp knife (cut of both ends). Carefully cut the squash lengthwise, go slowly enough to adjust the cut so it is as centered as possible. Remove seeds with a spoon. Peel the skin off each half of the squash. Place the squash face down on a steady cutting surface. With a sharp knife, carefully slice 1/4 " width slices into the squash starting at the top of the squash and work your way towards the bottom. Slice on the diagonal. Slice down through the squash carefully, leaving approximately 1/2" uncut at the base of the squash to keep the squash intact. When you get to to the belly of the squash, carve the knife around the edges, being careful not to cut through the squash. 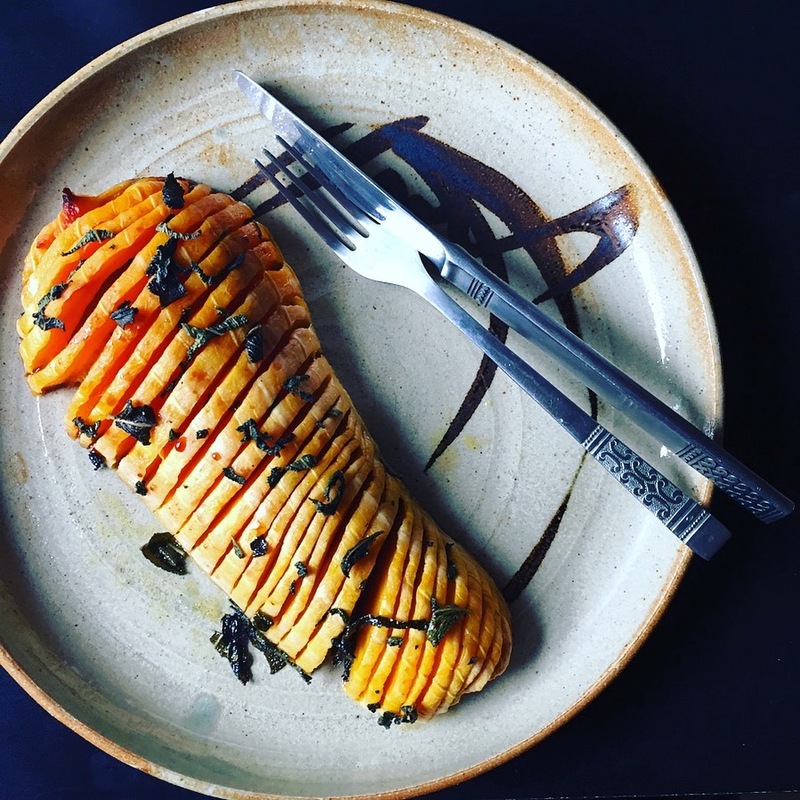 Once the squash is hasselback-ed, gently brush with olive oil, sprinkle with sea salt and chopped sage, carefully stuffing sage in between the slices. Place face down on parchment lines baking sheet and bake for 60-75 minutes. After 40 minutes of baking, remove squash and brush with olive oil, do this every 15 minutes until brown begins to form. When squash is almost done, drizzle with a touch of maple syrup or date syrup and return to oven for the final 10-15 minutes. Serve immediately. (If you want to make these ahead for a dinner party etc. leave the squash under cooked and then finish the cooking just prior to mealtime. Enjoy. Chicories are our bitter winter greens that don't often immediately appeal to our pallets. I've heard it said of the bitter flavor, that "bitter makes the liver smile". Our mainstream food is almost, if not completely, devoid of bitter flavor (beer has some bitterness to it, but is a beverage :-/). Adding the bitter flavor to our diets is one of the best digestive wellness moves we can make. The bitter flavor in dark green leafy vegetables like kale, dandelion greens, and chicories (endive and radicchio pictured above) makes out livers very happy because it stimulates our bile production which plays an essential role in digestion, particularly, the breakdown of fats and oils. So, adding bitter greens to you weekly, if not daily diet, is super easy and super supportive. This Seared Endive and Radicchio can be served as a salad or side, or with an egg for breakfast, however you fancy. Add balsamic, olive oil and sea salt to a medium sized mixing bowl and whisk together to emulsify. Gently place each half of chicory face down in olive oil/balsamic mix to coat. In heated skillet, sear endive and radicchio halves, about 1-2 minutes on each side. Use tongs to easily flip chicories to cook a bit on other sides too. Continue to cook in skillet 2-3 minutes longer to soften the leaves sufficiently. Place on serving plate and finish with a garnish of lemon zest, crushed toasted hazelnut and a sprinkling of parmesan or desired cheese (good vegan options are nutritional yeast or gomasio). Serve immediately & enjoy. Add all ingredients into a high-speed mini blender and blend on high for 15 seconds. Pour into your favorite morning mug and enjoy! Alternately, if you don't have, or don't care to use a mini blender, simply mix ingredients directly in your favorite mug.